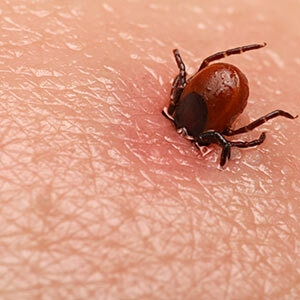 Tick season brings with it far more than some creepy 8-legged vampires, it brings with it a wave of Lyme disease. An inflammatory disease that can cause headaches, fever, arthritis, neurological disorders and cardiac problems. Lyme disease is caused by a bacteria transmitted through tick bites. Infected ticks that are attached for 36 or more hours are capable of transmitting the disease to the host, making it crucial to do regular tick checks. There is currently no vaccine for Lyme disease, making preventative measures the best way to protect yourself. Not every tick carries the disease, but there are a few early signs to watch for. If you exhibit any of these, it is important to contact your medical professional immediately and seek treatment. Bullseye rash – A rash will appear surrounding the bite area in a near perfect circle. Surrounding the inner rash there will be a thin ring, giving the appearance of a bullseye. It is important to note that not all people will experience this bullseye style rash. Blistering lesions – Some individuals experience a blistering lesion on the affected area. Often mistaken for a spider bite, it is actually an inflammatory reaction to the tick bite. Circular ‘bruises’ – Some people experience blue/purple skin rashes, resembling a bruise. Unlike most bruises, these skin lesions are uniformly circular and have a distinct border. Ticks attach themselves to birds, allowing them to travel huge distances and across bodies of water. Ticks can have three hosts in their lifetime. Often times they bite deer or small rodents, but they pose a serious threat to humans and their domesticated animals as well. Your dog could be playing in tall grass, host a number of ticks which can then bite you and your family. The number of diseased ticks is on the rise. While estimates vary widely between different regions, it is common to see upwards of 20% of ticks carrying Lyme disease. Lyme disease only became a national notifiable disease in 2009, so it is often un-diagnosed or misdiagnosed by health professionals. The United States Centers for Disease Control and Prevention (CDC) say that 300,000 Americans are diagnosed with Lyme disease each year. In 2013 they adjusted their estimates, stating that the rates were more likely 10 times higher than the number of diagnosed cases. Meaning that there are roughly 3 million cases of Lyme disease in America each year. As we get a better understanding of Lyme disease and become more able to properly diagnose it, the true scope of the issue will be revealed.